Concrete4U were asked to supply concrete for the construction of a level crossing. This took place during the night to minimise disruption. The volumetric mobile batching plant was ideally suited to this kind of work as we had to wait for 2 hours before the planned start time, then stop and start production of fresh concrete over a 5 hour period. Conventional concrete batched at a static plant and delivered pre-mixed in a drum would have become unusable part way through the pour, but with the Concrete4U volumetric truck we could make the concrete as and when required, a little drier when it started raining, a little wetter when the contractor needed to put a smooth finish on the edges. 9 cubic metres were ordered, but less than 7 used each night. But this was no problem as we only mixed what was required and the customer only paid for what they used. There was nowhere to wash out or dispose of excess concrete, but again this was no problem as with a volumetric mobile batching plant there is no waste and no returned concrete. 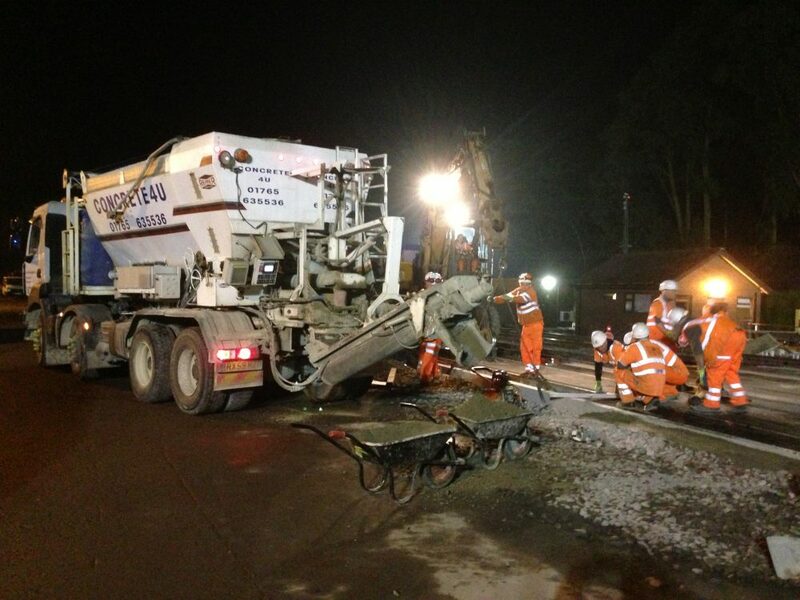 If you need out of hours or night time delivery of concrete, do not hesitate to contact Concrete4U for a quotation. © Copyright Lightwater Quarries Ltd. All Rights Reserved. Another Effective Group Website.